I had been itching for a new challenge. 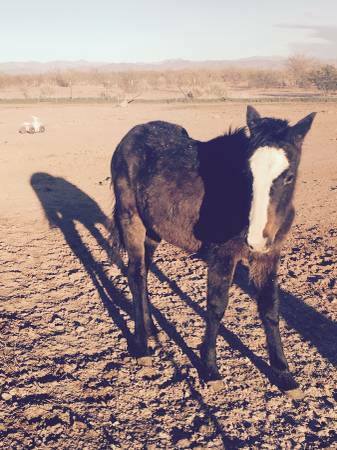 This little filly was born on a ranch up in northern Arizona, and became a causality in a horse dispersal the fall of 2016 when the ranch owner passed away, and the remuda were sold off by the children of the owner. 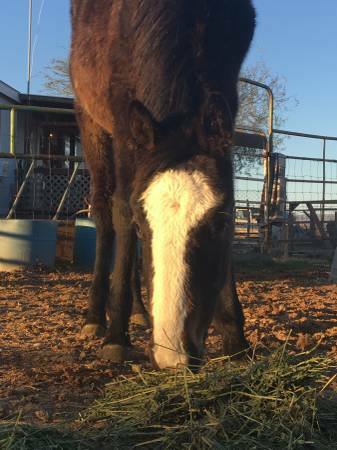 A young couple from San Tan Valley, who bought her at the age of three months old, quickly realized that they had bit off more than they could chew, and within a few months put her up for sale. She was completely untouched. She lived on the couples back acre with a pony, and they couldn't get near her (she would quickly move away). I went and saw her in early April of 2017 after work, and after about fifteen minutes or so, I was able to get the filly to willingly come within five feet of me...wary but curious...and I knew she was the one. She was foaled approximately September of 2016, and the first thing that I noticed was that her conformation is spot-on. She has a beautiful, refined head, and she is very leggy. I have carved out a stall for her nearest to the house and alongside Doc, putting her in a spot that I can work with her at every opportunity and Doc, the true 'nurturer', can provide comfort and guidance from a horse's perspective. I named her Lacy... I don't know why, except that it feels right. Expect to hear more on her over the coming days/weeks/months as she progresses.